Can ya'll tell I am totally digging Revlon lip products lately? Well, I am! OMG, where have Revlon lippies been all my life. Tee-hee, apparently right in front of me and I didn't even know how great they were! 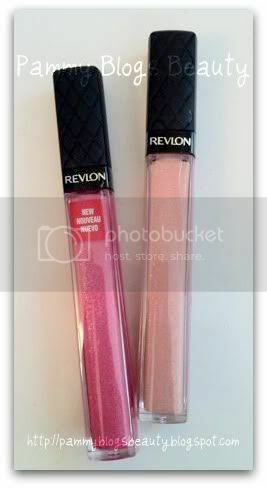 So, the Revlon kick continues with these amazing new Revlon Colorburst lipglosses. 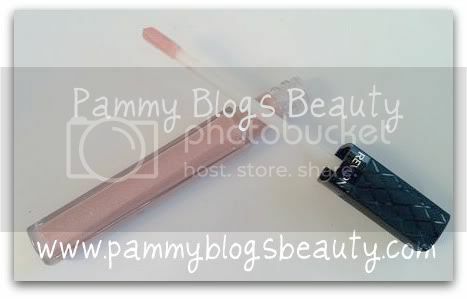 If you haven't read my previous Revlon Super Lustrous Lipgloss review, then certainly check that out here. Those are still amongst my fav glosses, but these Colorburst glosses drew me in with the promise of more color. Are they packed with color, oh yeah they are! Totally!!! For swatches, photos, and descriptions, please keep reading! So, I picked up the shades 010 Hot Pink and 004 Pink Ice. Yes, I am always into pinks and nudes! :) Hot Pink wears as a medium bold pink on my lips. Pink Ice is a lovely shimmery very light/nudish pale pink. These are highly pigmented glosses. They wear more like a liquid lipstick than a true "gloss". These glosses are not sticky! Yay!!! No scent, like at all (unless these seasonal allergies are impacting my smelling abilities!). I really don't detect a scent. You are going to get color and shine with these. And a TON of glitter. The glosses are pretty moisturizing and feel light on your lips. They feel pretty good going on. But, you can almost "feel the glitter". While the color doesn't last long, the glitter does (so you may have a bit of a "sparkle residue"). You are going to have to keep reapplying these to keep your color throughout the day (as you must do with most lipglosses). The packaging is just gorgeous! Revlon really makes their products "look" high end. They have a doe-foot applicator that dispenses just the right amount of product. The tube seals tight with a click. Great price at about $8 and you get a lot of product. I think the quality really is comparable to high end liquid lipcolors. Overall, I like both of these glosses. The downside would be just a "tad" too much glitter, but I find that I am still wearing them and might even purchase some other shades. I reach for these when I want a bit more "color" than my usual sheer glosses (like the Revlon Superlustrous, which I adore) will provide. I tend to wear these in the evenings a bit more than during the day because of the heavy sparkle. I am a fan of sparkle elsewhere throughout the day (with the exception of the lips). Excellent review, I'll check them out. I really do wanna try these but it would break my project lip product. so i suppose Ill have to wait. but they sound amazing! When I picked out mine I definitely noticed the glitter factor. Papaya is a nice almost nonglittery one, but ya most of them are packed full of the stuff, which is why I prefer my super lustrous over these, but the packaging is super nice. Thanks for the honest review! I'll avoid these, as I don't care much for glittery lips, but I love the Super Lustrous glosses! @Val-You got it! :) Yes, if you are not a fan of glitter, that these would be way over the top! Hey Tracy: tee-hee at your drugstore "lurking"! ;) I know what you mean, there are certain items that I *always* look at yet somehow never purchase. Hey Gaby! Thanks dear! Yes, these are quite pigmented for a gloss and I do love that they are not sticky...revlon seems to have mastered the texture for their glosses to be thick yet not sticky!